Collaborators: Community Activist Eoghan Howard; Jennifer Jones, Uni of the West of Scotland; WHALE Arts; Prospect Community Housing; Wester Hailes Health Agency. Based in the Edinburgh suburb of Wester Hailes, the team of academics, community organisations and local activists have been exploring the affordances of social media to construct ‘bonds’ and ‘bridges’ between and across existing people and groups. 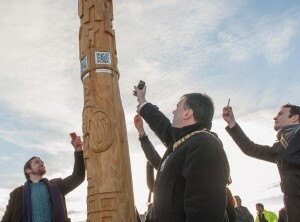 Outputs include a four metre digital totem pole with QR codes that allow residents to connect to services and share resources, a CodeBook that supports guided walks from the Healthy Living Centre, and development of a community newspaper (online and offline).